In the United States, the average family uses more than 300 gallons of water per day, with indoor water use accounting for about 70 percent of this. As the second most populated state in the country, Texas has a large and continually growing demand for water. 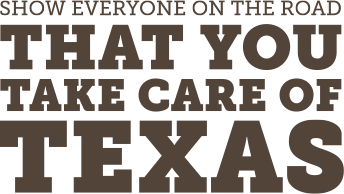 But, if all Texans work together, we can conserve billions of gallons of water each year. Household leaks in Texas alone could waste more than 90 billion gallons of water each year. By repairing leaks in your home, you could reduce your water use by 10,000 gallons a year and save 10 percent on your energy bill. Toilet leaks are especially problematic because they can waste up to 200 gallons of H2O a day! How Do I Know if I Have Leaks? You can discover whether your home has leaks by checking your water meter before and after a two-hour period when no water is used. If the meter changes at all, you may have a leak. Another method is to look at your water bill during the colder months. If a family of four is exceeding 12,000 gallons a month, there may be serious leaks. The good news is that many household leaks are easy and inexpensive to fix. If you have leaks, visit the Environmental Protection Agency’s Fix a Leak Week website for help with identifying the source and fixing the problem. Everyone can do their part with just a few simple actions. Some of these tips are also easy for kids to learn. Use the dishwasher instead of hand-washing dishes, and only run it when you have a full load. Scrape dirty dishes and cookware rather than rinsing them. Plug the sink or use a basin of soapy water if washing dishes by hand. Keep a pitcher of water in the refrigerator rather than letting the faucet run until the water is cool. Take shorter showers. Get a shower timer for your kids and make it into a game. Turn off the tap when shaving or brushing your teeth to save up to 2,400 gallons of water a year. Wash only full loads of laundry to save more than 3,400 gallons of water each year. Learn how to reduce food waste. It takes water to grow, manufacture, and transport our food. The biggest uses of water indoors are flushing toilets, running faucets, and taking showers, respectively. Replacing these fixtures with WaterSense-labeled ones will save over 16,000 gallons of water and $200 a year. The WaterSense label identifies products that save water and money without compromising performance. Using water-efficient fixtures will also save energy by reducing demand on water heaters. Most people don’t think about water conservation when they hear ENERGY STAR. However, dishwashers and clothes washers with this label save water in addition to energy—all without sacrificing features or functionality. 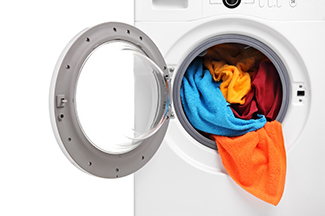 Replacing a standard washer with an ENERGY STAR one can conserve over 2,000 gallons of water per year. Additionally, ENERGY STAR models have greater tub capacities, so families can wash fewer loads—saving time in addition to benefitting the environment! ENERGY STAR dishwashers use advanced technology to get your dishes clean while using less water and energy. By upgrading to an ENERGY STAR dishwasher, you could save 3,870 gallons of water over the lifetime of the appliance. These models often feature a light-wash cycle, so that you can conserve even more if your dishes are only lightly soiled. If your old appliances are still in good condition, you can donate them to a secondhand store such as Goodwill Industries. If your washing machine is no longer working, or you choose not to donate it, many retailers will haul away your old appliance. Some retailers participate in the EPA’s Responsible Appliance Disposal Program, which ensures that chemicals are recovered and metal, plastic, and glass are recycled. You may be able to spend less on new ENERGY STAR appliances and WaterSense fixtures by looking for rebates, vouchers, and sales tax holidays. Check with your local government agency or utility to see if they have special offers. 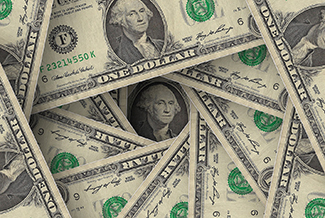 Search for rebates on the WaterSense website and the ENERGY STAR website. Check with the Texas Comptroller of Public Accounts for announcements about sales-tax holidays on ENERGY STAR and WaterSense products.